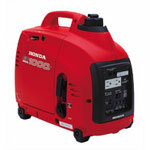 This super quiet generator is extremely portable, as well as fuel efficient. Running up to 8.3 hours on a single tank of gas when used with the Eco-Throttle feature. This easy starting generator produces only 59dB of sound at 7 meters running at full load, which is less than common speech. To prevent damage to the unit, the Oil Alert will shut the unit off when the oil drops below a safe operating level. DC terminal for use when charging 12-volt automotive type batteries.